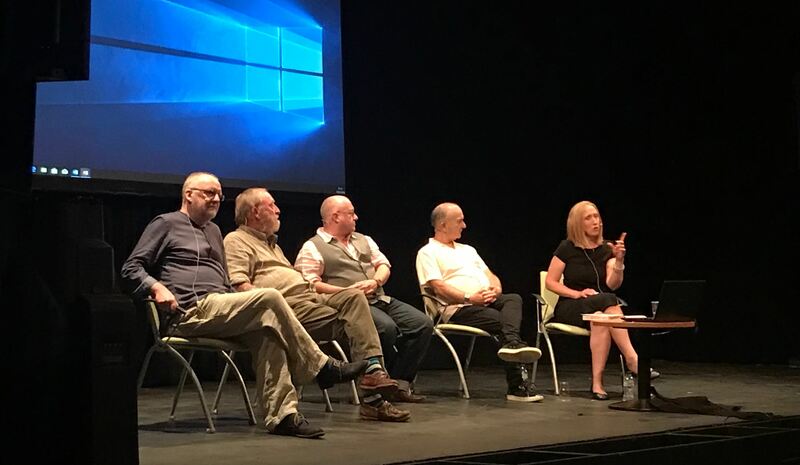 Our Cultural Heritage Officer, Dr. Catherine Parker Heath, recounts her recent brush with the stars of Time Team on stage in Buxton. As an undergraduate in the mid-1990s, my housemates and I would gather around the television to watch a new series on Channel 4 called Time Team. We would sometimes scoff at the ridiculousness of trying to conduct an excavation in 3 days (at this point, I was only aware of research excavations carried out in Mediterranean lands that lasted years), and we would bemoan the fact that geophysics always ‘got it wrong’. 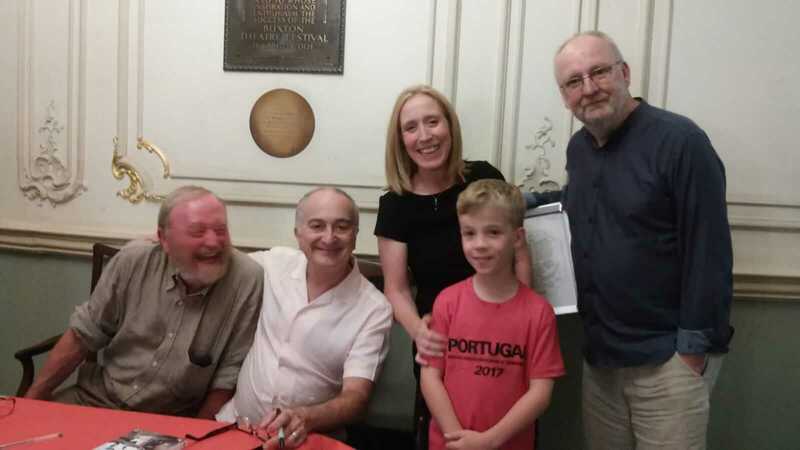 Little did I know then that 24 years later, I would be on stage with three of the Time Team – Tony Robinson himself, Francis Pryor discoverer of Flag Fen (a Bronze Age site near Peterborough) and John Gater, the geophysicist who I once thought always got it wrong. The idea of appearing alongside Tony, Francis and John at their Buxton International Festival show, ‘Digging Up Britain’, was first put to me back in early April. After saying that this sounded like a great idea and some emails back and forth, all went quiet, leaving me thinking that Tony would give me a ring sometime to discuss ideas of how things would go on the night. Weeks passed and I heard nothing. Friends urged me to contact Festival staff to see what was going on. I didn’t. That was until three months later, on the Wednesday before the show was due to take place, I was thinking I should just have confirmation that I wasn’t going to appear, when the phone in my office rang. It was Tony Robinson. So that was that. I was to appear, as far as I understood then, for ten minutes near the beginning of the show to talk about archaeology in the Peak District in general and the South West Peak in particular, with the chance to talk about the South West Peak Landscape Partnership and the projects that I was involved with. What I was to say would be framed around three questions: What was good archaeology in the area? What was great archaeology in the area? What were the gaps? There is lots of good archaeology in the Peak District and in Buxton itself, I said, including nationally important archaeological sites. I mentioned Arbor Low, the Neolithic henge monument near Monyash, often called the ‘Stonehenge of the North’, and I also mentioned its lesser known sister site at Dove Holes, the Bull Ring. I spoke about Peveril Castle at Castleton, an early Norman castle, and I also spoke about Pilsbury Castle a less well known early Norman site in the Dove Valley and which also happens to be in the South West Peak. I described Lismore Fields the site of rare Neolithic structures that is in Buxton itself (and also within the boundary of the South West Peak), although there is nothing visible to see above ground. I mentioned the fact that although the landscape of the Peak District looked natural it was in fact a cultural landscape, with very little if anything that hasn’t been affected by human hand. Well this is great archaeology, I said, as I showed a slide of three of ‘my’ South West Peak volunteers, all togged up ready to record heritage assets in the cold of early April with smiles on their faces. I explained how I thought that it was the engagement of people, communities, groups and individuals, in their heritage and the past around them that makes archaeology great. If I didn’t mention the role Time Team had played in bringing archaeology and cultural heritage to the forefront of peoples’ minds, I really should have done at this point. I made sure I mentioned Peeling Back the Layers though, a community archaeology project I had previously been involved with in the South West Peak. I said that this was great archaeology because of the community of people that were involved. 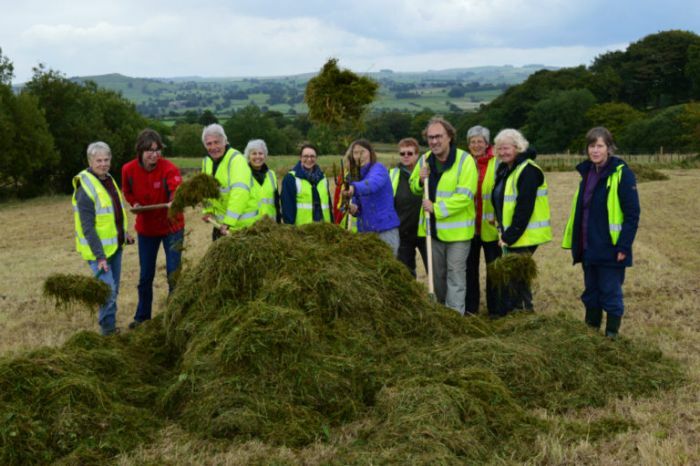 I spoke about this same group of people applying for funding from the South West Peak Landscape Partnership’s Community Grant Scheme to undertake further exploration of a suspected medieval house platform (which will hopefully take place next Spring). I spoke about the projects I am delivering for the Partnership, the Barns and Buildings and the Small Heritage Adoption project and how I wouldn’t be able to do them without the help of volunteers. I wanted to say more but there was still one question to go. Well, you may be mistaken for thinking we know everything there is to know that’s out there in an area like the Peak District National Park, I replied. But we don’t. I explained that during a pilot survey for my South West Peak projects we recorded 118 assets, and only 20 of these were already known. I mentioned that in Buxton itself, I felt the biggest gaps were what we knew or didn’t know about the Roman town, largely because of the later Georgian and Victorian building such as the Crescent, which, incidentally, had been built using the proceeds from Ecton copper mine, just on the edge of the South West Peak, which had been mined since the Bronze Age. And that was the end of my bit. Francis Pryor came on and greeted me like an old friend. It was like being on a chat show and I was loving every minute of it! I listened to what he said and was careful not to push my hair behind my ear for fear of affecting the microphone that was attached to my head. Then Francis finished his bit and John came on. Just like a chat show, he greeted each of us. No matter how many times I might have watched Time Team, I hadn’t actually realised how funny John was and he teased Francis mercilessly throughout his bit. And then it was the interval. Somehow we had all managed to keep to time – to the exact minute. Then to the second half. This was a Q&A format. I was asked questions directly and invited to contribute to others. My eight year old in the audience stood up, held the microphone and directed a question to John. I was sure his dad had put him up to it, but I later found out he hadn’t. I felt very proud. It all went smoothly. There was nothing too difficult nor controversial. And then all that was left was the book signing. In truth I was only asked to sign one book, but as I hadn’t actually written one I felt this was fair enough. People queued to speak to, have books signed by and photos taken with the Time Team. I was impressed by the enthusiasm that people had for the show and the presenters.